What is the PS5000 Series? In recent years, many new manufacturing concepts have become popular, from the Internet of Things to Industry 4.0. It's safe to say that manufacturing is in a current period of major change. In an era where it's easy to take advantage of the benefits of IT and cloud-computing, data regarding trends from markets, production, distribution, and consumption are easily accessible, making it possible to drastically reduce waste through expansion of data-driven business. This, in turn, is becoming a prerequisite for remaining competitive in manufacturing industries. In order to utilize manufacturing data, large amounts of data must be compiled at various locations, and using a general-purpose OS such as Windows for on-site devices and equipment is a simple way to easily and accurately connect those devices. However, many factory lines and equipment feature legacy operating systems, and directly connecting that equipment to a network can be difficult without modification. In this way, the introduction of the PS5000 Series is a breakthrough product for bringing manufacturing into the IT and networking era. With a generous helping of the latest technology, this industrial PC is designed to offer a stylish design and operability that anyone can master. Developed as a key device acting as a gateway to IT- and network-based manufacturing, the PS5000 Series comes in a number of variations, from thin type to modular type and box type. 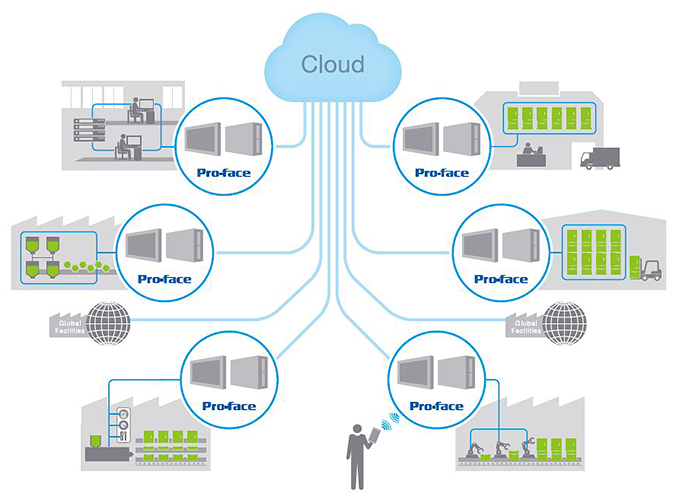 Thanks to Pro-face's high connectivity with legacy equipment — a result of developing HMI products for manufacturing settings over many years — and the innovative software technology that makes controlling such devices a breeze, the PS5000 Series offers a reliable "Powerful Solution" to the many needs of customers. For the details of PS5000 Series offering "Powerful Solution", please see the product page.